but still a very usable cattle chute. while waiting for the cattle truck to arrive. a wonderful place to take photographs. 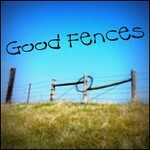 to view fence stories from around the world. I am sure if those old buildings could talk, you wold be amazed at what they would share. I can tell you from experience, from one cattle round-up I was on, the tall tales could fill a small book. That is a wonderful place. I like that weathered red. nice and rustic. thanks, meggie! Very nice shot of the cattle shoot and fencing. I like the weathered look.